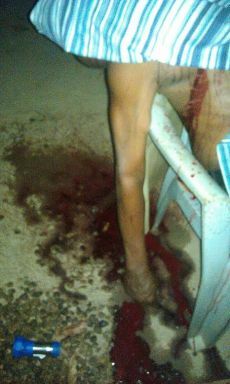 A 34-year-old ex-convict has butchered 5 persons at Assin Akrofuom in the Assin South constituency of the Central region. According to the Peace FM’s Central regional correspondent Oscar Adawo Dadzie, four of the victims were members of his family including his mother and father. Narrating the horrible incident, he said Kwabena Ganu asked his father, Agya Ganu to get him a different place to live after being in prison for 2 years, of which his father did by getting him a farmland at Assin Akrofuom on which he farms, but comes to town when he is in need of items he can only get in town. On Thursday evening around 7pm, holding in his hands two well-sharpened cutlasses he proceeded to his family house where he went butchering members of his family. On arrival he just cut off his father’s head, then severed off his 6-year-old nephew’s head too. He then proceeded to the kitchen where his mother was feeding his grand-mother and beheaded the two without asking a word from them. Oscar Adawo Dadzie said he also went into the chambers of the landlord, Kofi Tano who was also having lessons with his son, beheaded him and on top took off his hands and legs. His grandson who managed to sped-off was given a deep cut on his back. The Divisional Crime Officer for Assin Fosu, DSP John Coffie, who also confirmed the incident said a sixth victim however survived the attack and is receiving treatment at the St Francis Xavier Hospital at Assin Fosu. According to the DSP Coffie, they received a call that someone had killed his relatives at Assin Akrofuom. He said the suspect managed to escape but was apprehended by residents in a nearby village. The youth of the town upon hearing the bizarre story also killed him saying they cannot stay with such a human being in the district. DSP Coffie stated however that the suspect was brought to the police station dead. Due to the nature of the pictures we ‘BlissGh’ can’t post them here.